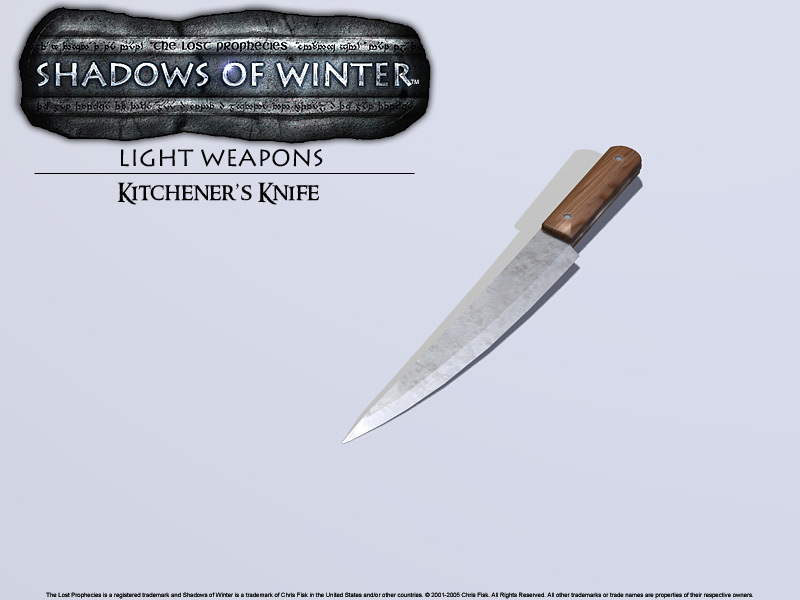 hadows of Winter contains a vast arsenal of weaponry ranging from simple knives to complex, runic grimoires containing the mysteries of magical spells within their pages. Click on the coloured portraits to view available imagery of the desired article of equipment. Greyscale imagery denotes currently unavailable equipment. Usable Items & defensive equipment will also be covered in this section. Some terms used within this page can be referenced in the Lexicon section of this website. There are six weapon categories that equipped weapons will be listed in: Light Weapons, One-Handed Weapons, Two-Handed Weapons, Archery, Divine Grimoire and Sorcery Grimoire. These categories will be visible when the player selects a weapon from the on-screen display. Inactive categories will not appear until a weapon from within its category is obtained. This category contains three weapons and players may possess a maximum of two (2) at any given time. 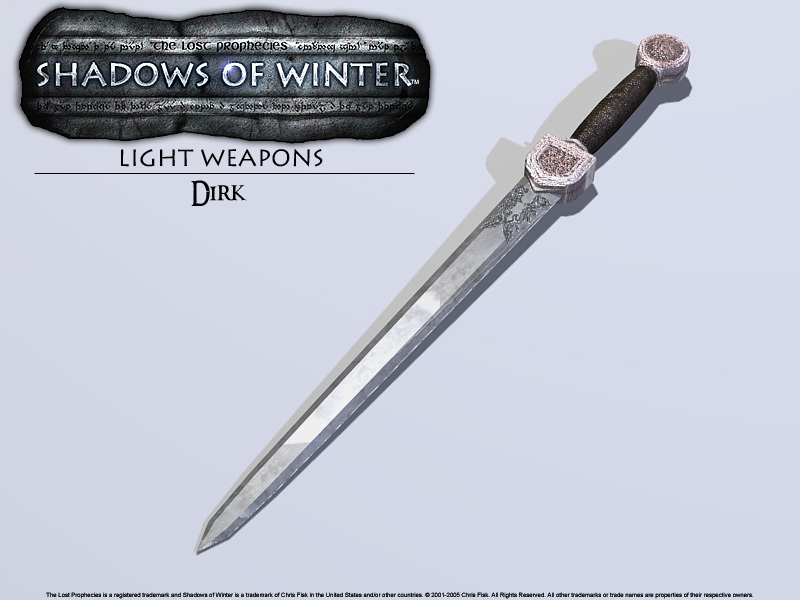 Considered to be the weakest of the weapon categories, Light Weapons usually serve as back-up tools to players possessing more powerful, yet slower, weapons. Shields may be equipped when wielding weapons from this category but may only be used for passive defense as AA is regelated to hurling Light Weapons. Stewards and diners alike use this light and rather sharp knife to slice food for easy consumption. Though very sharp, the knife is poorly balanced for proper use in combat. PA will swipe at opponents in close range while AA will throw the weapon at an extended range. Once thrown, the weapon must be retrieved in order to be re-quipped for continued use. Originally designed as a light-weight alternative when one's primary weapon was pre-occupied, the Dirk possesses more potential to slay armed opponents than the Kitchener's Knife. 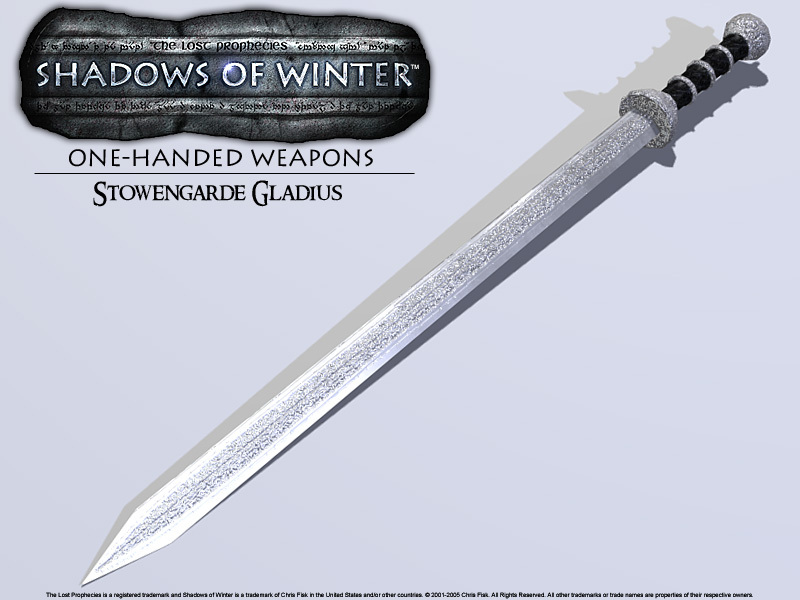 The blade contains two equal cutting sides that grant the wielder a better chance at penetrating flesh and its perfectly balanced, full-tang construction makes this weapon quite sturdy. PA will swipe at opponents in close range while AA will throw the weapon at an extended range. Once thrown, the weapon must be retrieved in order to be re-quipped for continued use. 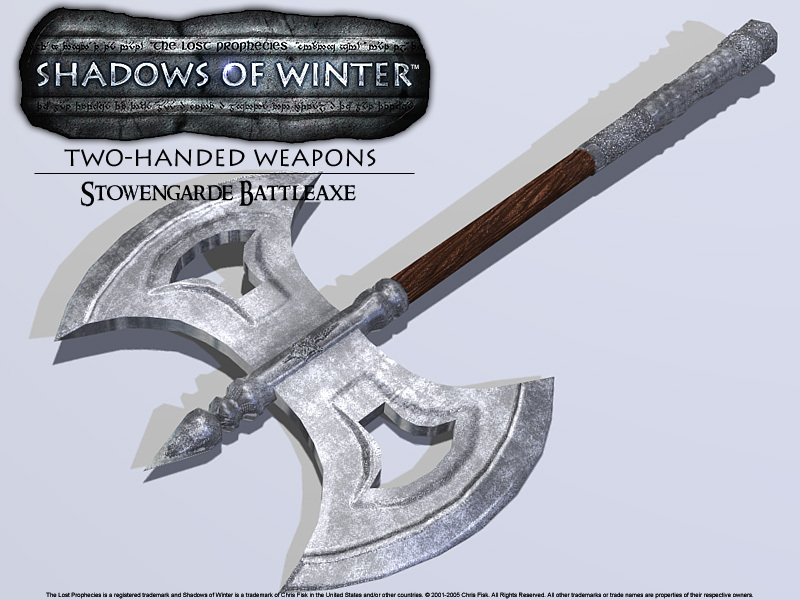 Named "Ravage & Agony," the twin axes of Stowengarde have been forged with a dwarf's meticulousness for unrivaled durability & sharpness. Slightly slower than the other Light Weapons when not paired with their mate; the Twin Axes' full potential is released when equipped akimbo. Wielders possessing both axes unlock their blazing speed. PA will hack at opponents in close range while AA will hurl the weapon at an extended range. Once thrown, the weapon must be retrieved in order to be re-quipped for continued use. 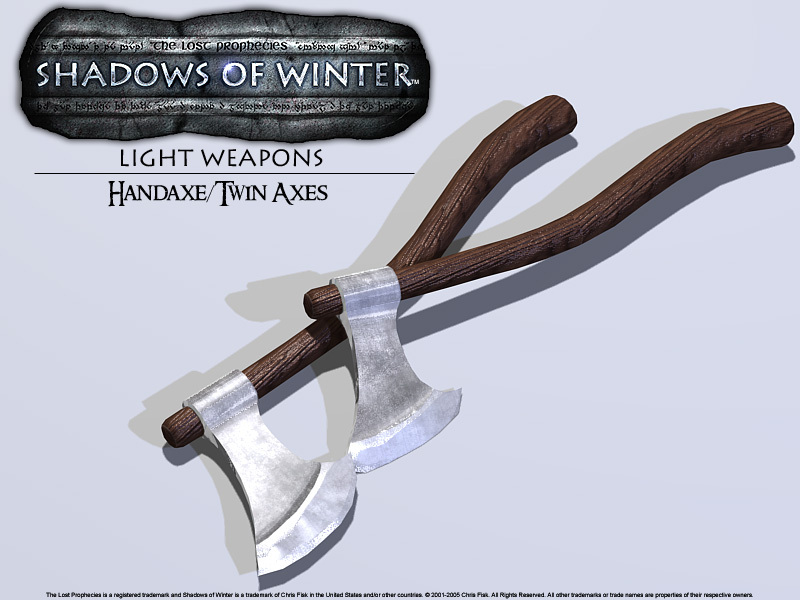 If the axes are paired, the weapon will become a single Hand Axe after the first throw and can be hurled again for an additional ranged attack before retrieval is needed. This category contains four (4) weapons that require only one hand to wield. Players are allowed to possess a maximum of two weapons within this category at any given time and shields may be equipped when wielding any of these weapons. 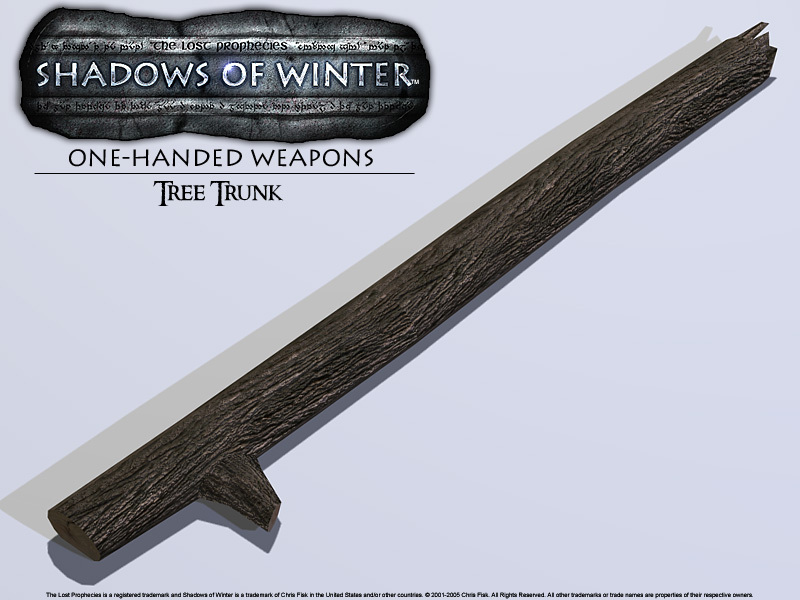 A resourceful player may find a reliable tool when using this unorthodox weapon. Seemingly innocuous, the Tree Branch/Trunk/Torch/Cresset/Femur can serve multiple deadly purposes when in the hands of a skilled combatant. Blunt weapons such as this are also more effective against the undead creatures that possess bones that must be crushed to subdue them. The main drawback of this weapon is its fragility and tendency to break at inopportune times. Wielders are strongly cautioned to always have a back-up weapon handy. PA swipes at opponents within close range and AA will parry incoming attacks somewhat dependably. When lit with Naphtha, this weapon will last indefinitely aflame and provide a source of light for the wielder. Once dropped however, it will be extinguished. 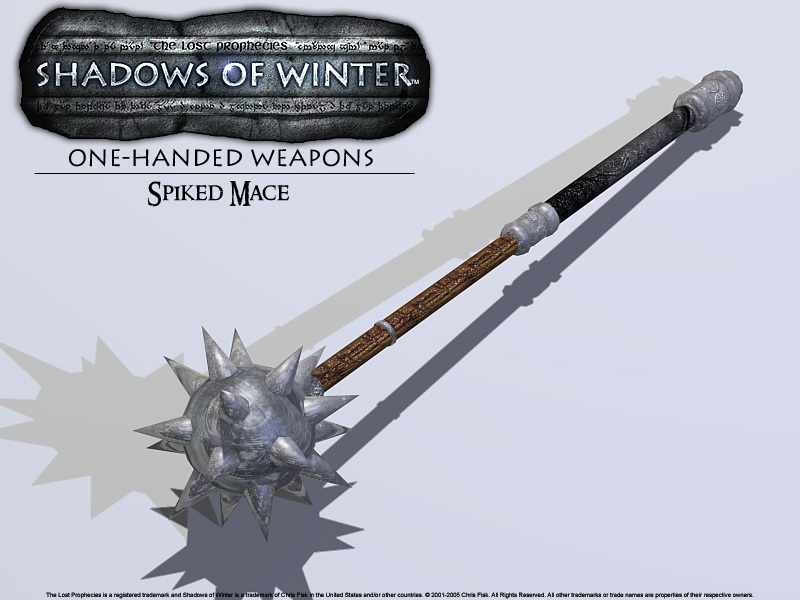 Weighted clubs outfitted with metal spheres atop their hafts and speckled with razor-sharp spikes or flanges, the Mace is the preferred bludgeon of a seasoned warrior. PA hacks at opponents within close range while AA will parry incoming attacks somewhat dependably. Given the name "Malice" by its dwarven creators, this exquisitely crafted weapon is not only the most effective against the legions of undead that plague the lands but is also the slowest weapon within the One-Handed Weapon category. PA swipes at opponents within close range and AA will parry incoming attacks somewhat dependably. This is the staple weapon of the armies of Parmathia. 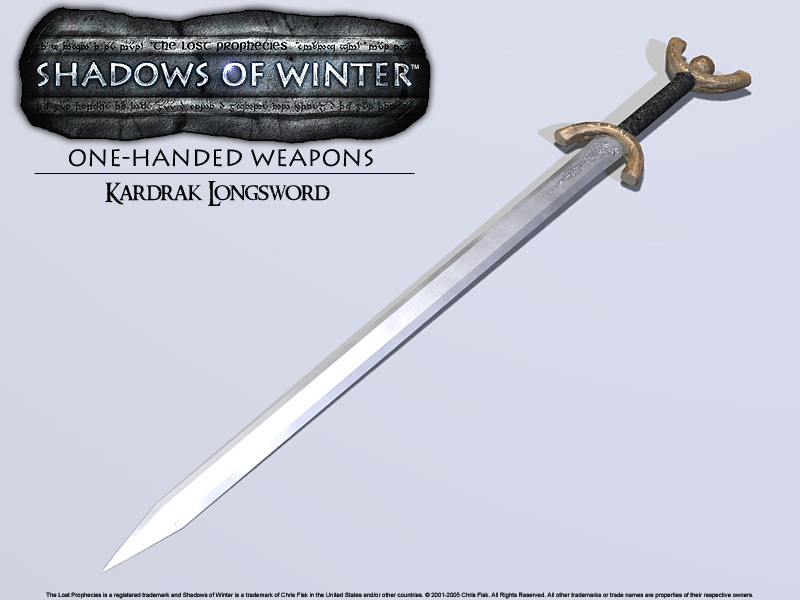 Light, relatively fast and extremely sharp, the sword can hack off limbs and impale opponents when in the hands of a skilled warrior. PA hacks at opponents within close range and AA will parry incoming attacks dependably. 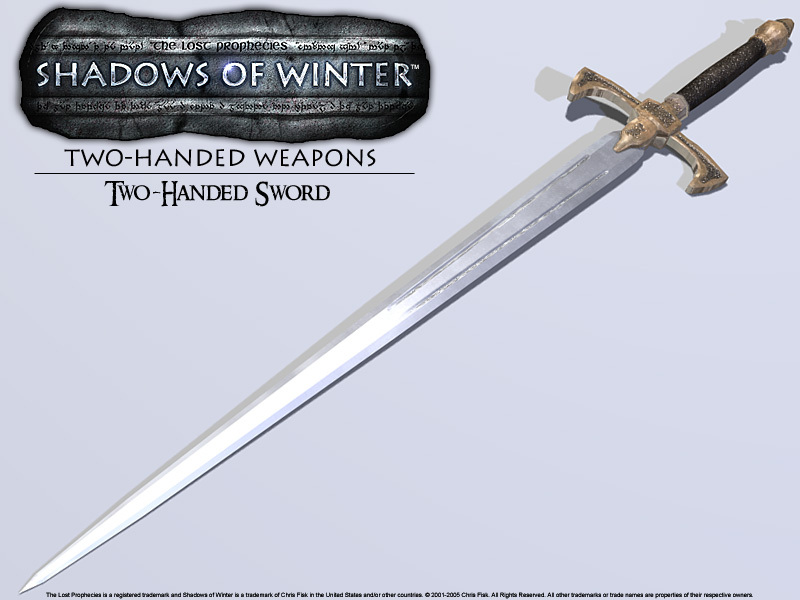 This category contains seven weapons that require both hands to wield and can be used to defend incoming attacks more effectively than most One-Handed Weapons. 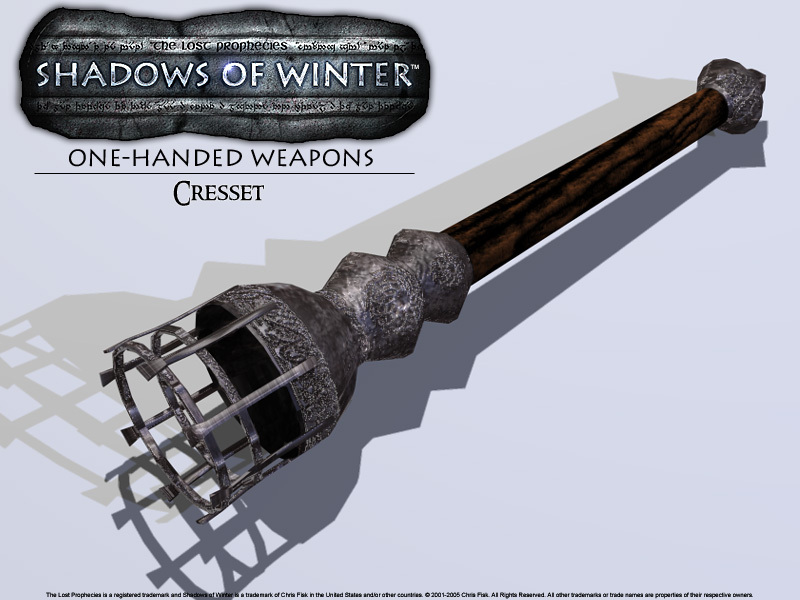 Players are allowed to possess a maximum of two weapons within this category at any given time. Shields may not be equipped when wielding weapons from this category and will be dropped when a weapon from this category is selected. This short spear isn't very sturdy and its crude construction defines its primitive uses. 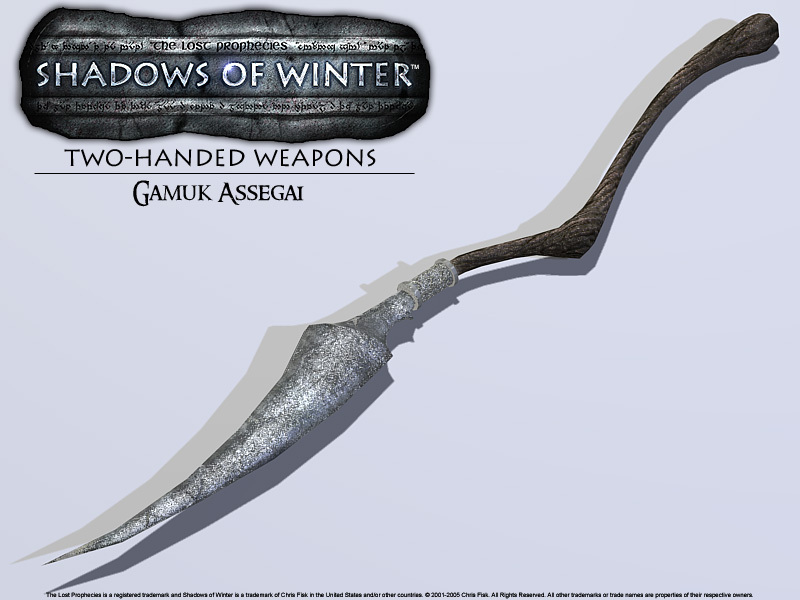 Wielded by the savage Gamuk, this weapon poses little threat to a heavily defended opponent however, when a pack of Assegai-wielding Gamuk descend upon a lone target, this weapon can strip away the flesh from an overwhelmed victim within seconds. PA thrusts at opponents within close range and AA will hurl the spear at opponents within an extended range. When the weapon is thrown, it will need to be recovered in order to be used again. 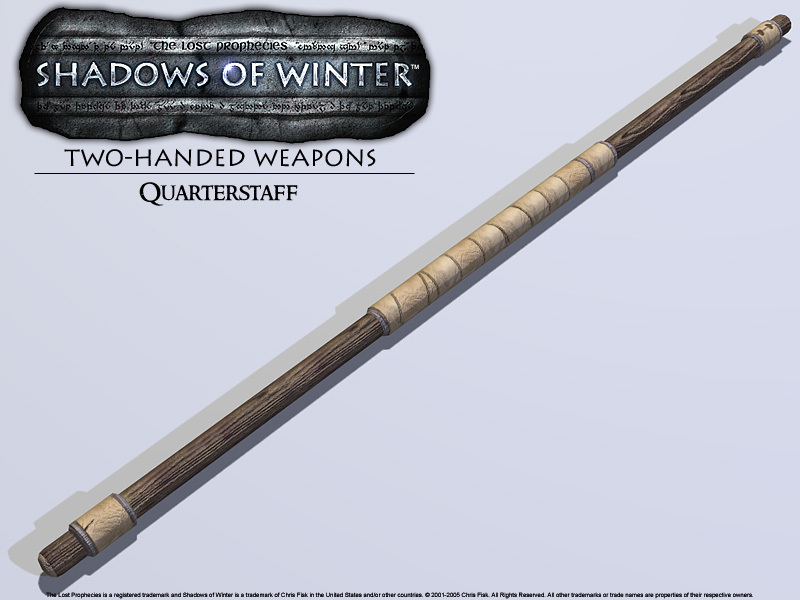 Comprised of a solid wooden shaft of ash or oak with weights added to both ends, this staff can deal a modest amount of damage to living opponents and gains a bonus to the undead. Its increased ranged over One-Handed Weapons allows wielders to keep opponents at bay and deal damage from somewhat farther away. PA swipes at opponents within medium range and AA will parry incoming attacks dependably. 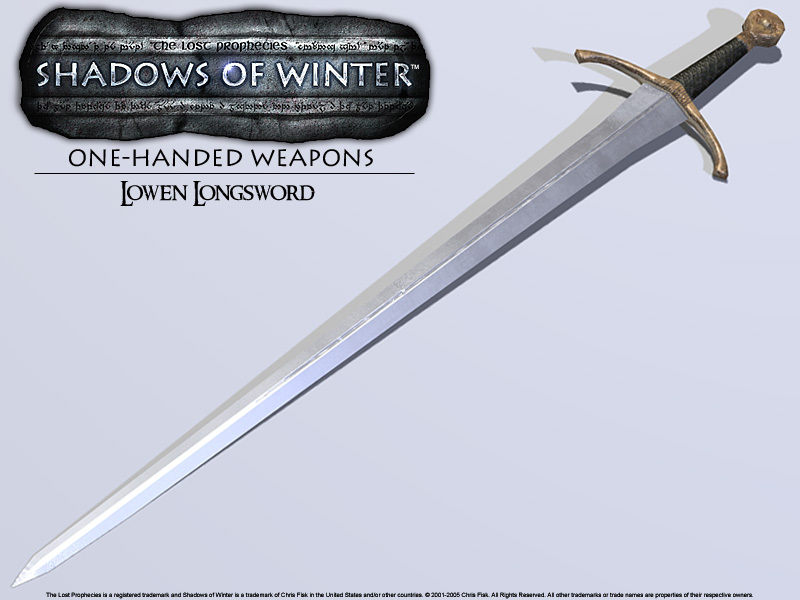 This heavy sword requires great strength to wield effectively and its superior damage over one-handed swords is balanced by its slower attacking speed. PA hacks at opponents within medium range and AA will parry incoming attacks dependably. 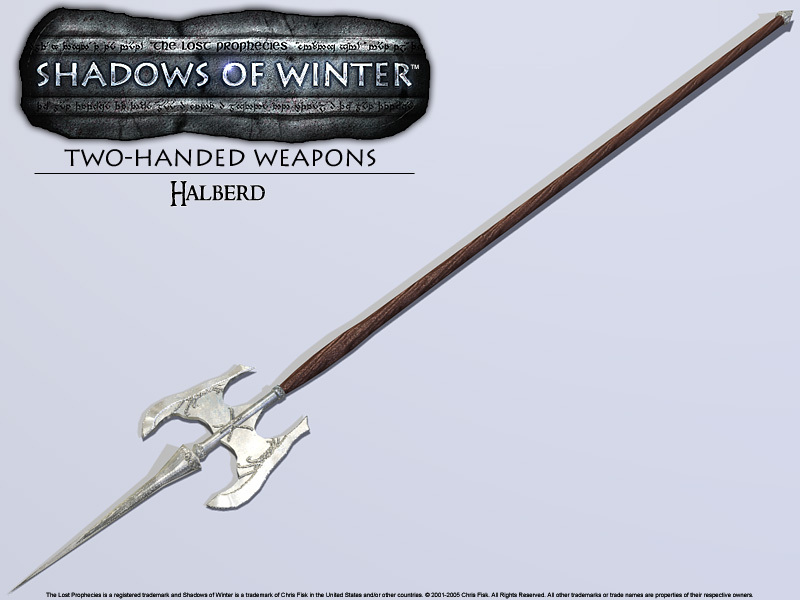 Double-bitted, bearded blades extend from atop the weapon's haft and are designed to hew limbs from opponents with a butcher's ease. 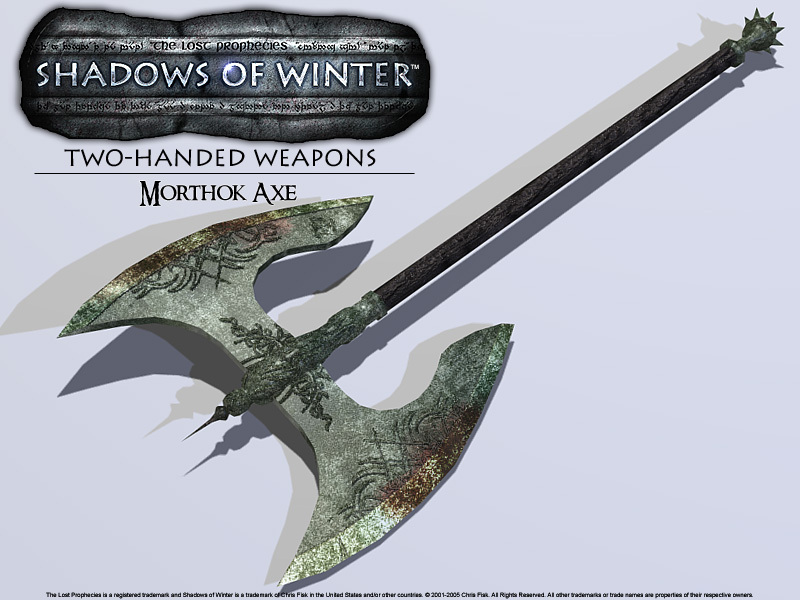 This axe is the favored weapon of both the Stowengarde army and the Morthoks for being able to cleave through opponents at close range. PA hacks at opponents within close range and AA will parry incoming attacks dependably. 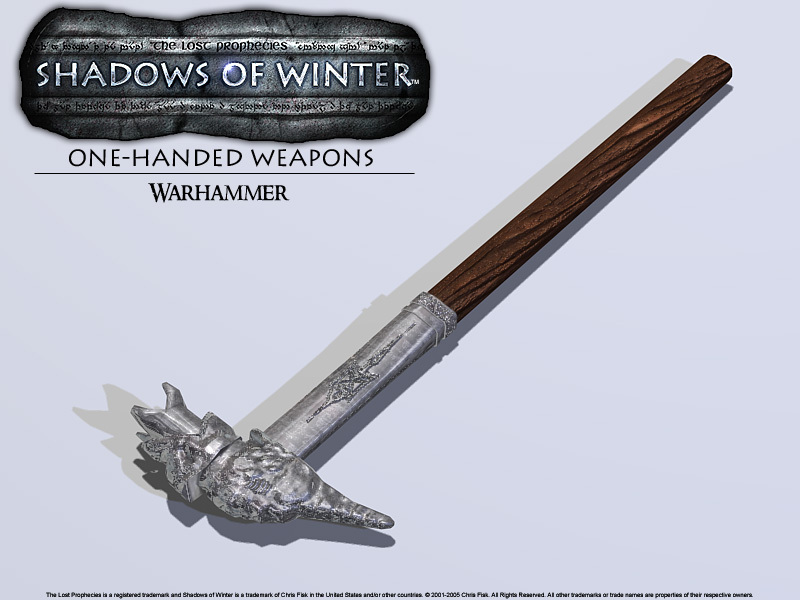 These combat-oriented polearms offer great range and considerably more damage than the Quarterstaff at the cost of being slightly slower and offering no bonuses against the undead. PA swipes at opponents within medium range and AA will parry incoming attacks dependably. Primarily used for dismounting cavalry and chopping the heads off of polearms, the Zweihänder is also effective in keeping opponents at bay with attacks that reach considerable range. PA swipes at opponents within medium range and AA will parry incoming attacks dependably. Possessing the longest reach of any melee weapon within Shadows of Winter, the Pike is generally used to dismount cavalry and strike opponents from distances that cannot be reached by other melee weapons. Wielders are not suggested to engage infantry possessing smaller, faster weaponry due to the restrictive speed penalties this weapon contains. PA thrusts at opponents within a medium-extended range and AA will parry incoming attacks somewhat dependably. 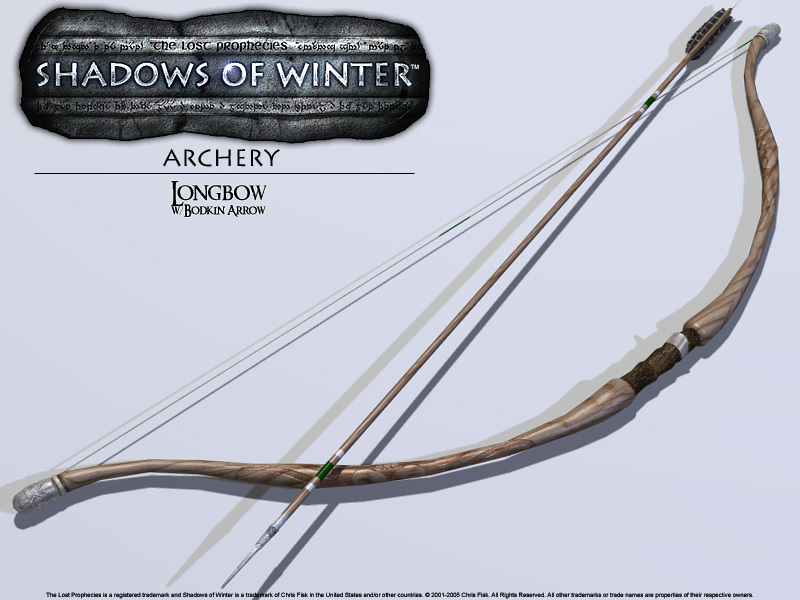 No first-person shooter game would be complete without ranged weapons such as bows & crossbows added to the arsenal. 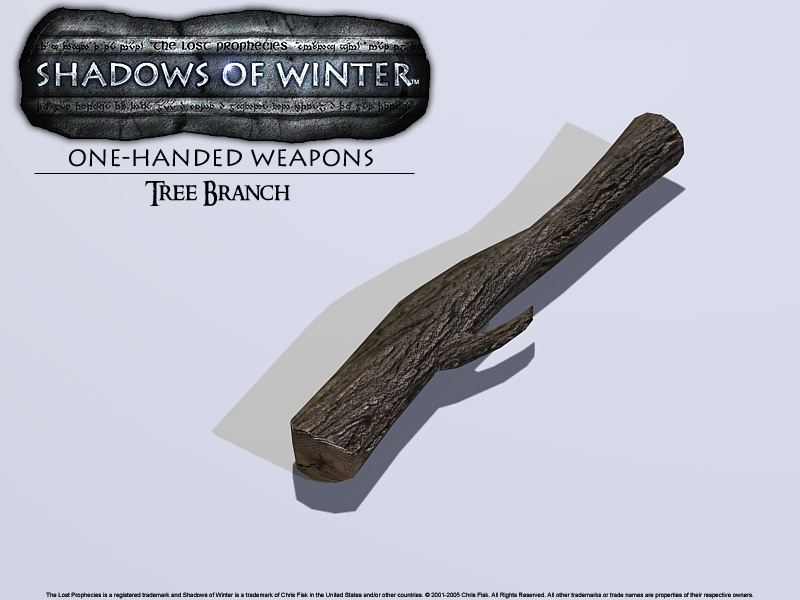 Unlike the quick-fire weapons of most fantasy games, the bows & crossbows of Shadows of Winter are somewhat more realistic and are required to be spanned and aimed before firing. There are four weapons within this category and players are capable of possessing a maximum of one weapon from within it at any given time. All archery-based weapons only inflict half of their normal damage to the undead. 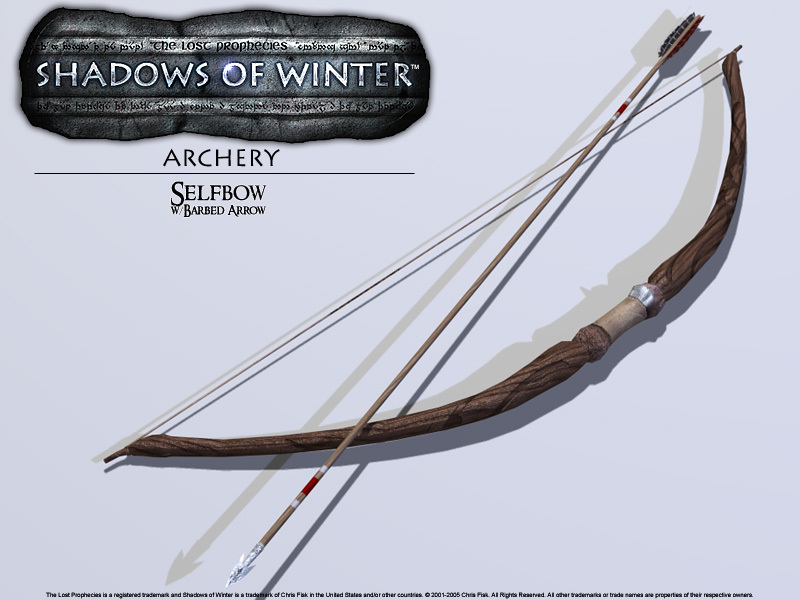 Primarily used by poor hunters and lacking the penetration power of its more advanced counterparts: the Longbow and Recurve Bow, the Self Bow is generally used when military weaponry is in scarce supply. PA will span the bowstring back and when released, the bow will fire. AA will zoom in through the bow's aiming mechanism for a better view of far away targets. Bows fired before the bowstring has been fully spanned will produce unpredictable results and may cause arrows to fly in unintended directions without effective damage inflicted. Constructed from supple yew and reaching over six feet in height, the Longbow serves to rain volleys of arrows on opponents from afar. Throughout the wars of Parmathia, the Longbow has, on more than one occasion, decided the outcome of battle. Due to its relatively slow attack speed, this weapon is not ideal to engage opponents within close range. PA will span the bowstring back and when released, the bow will fire. AA will zoom in through the bow's aiming mechanism for a better view of far away targets. Crafted from composite materials that allow it to maintain the range of its larger cousin; the Longbow, the Recurve Bow is somewhat more accurate and takes less time to fully span. PA will span the bowstring back and when released, the bow will fire. AA will zoom in through the bow's aiming mechanism for a better view of far away targets. 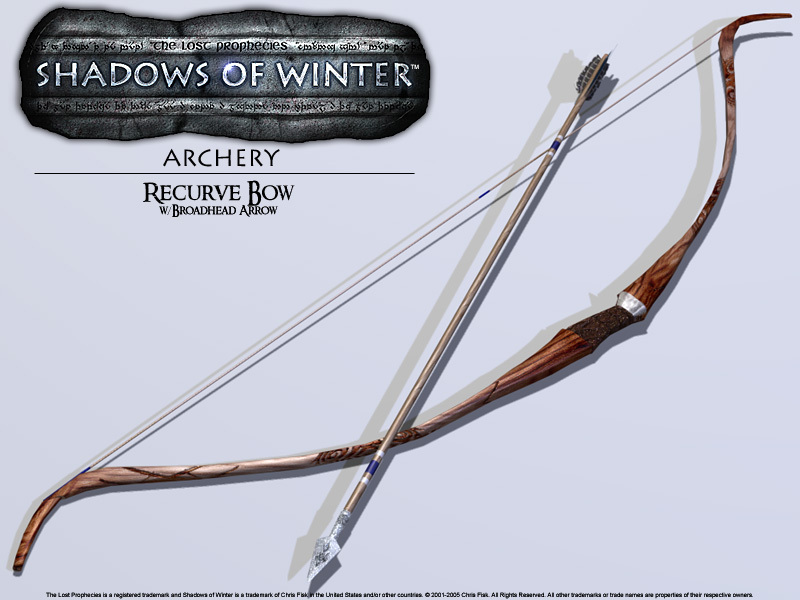 This is the favored bow of assassin and hunter alike. 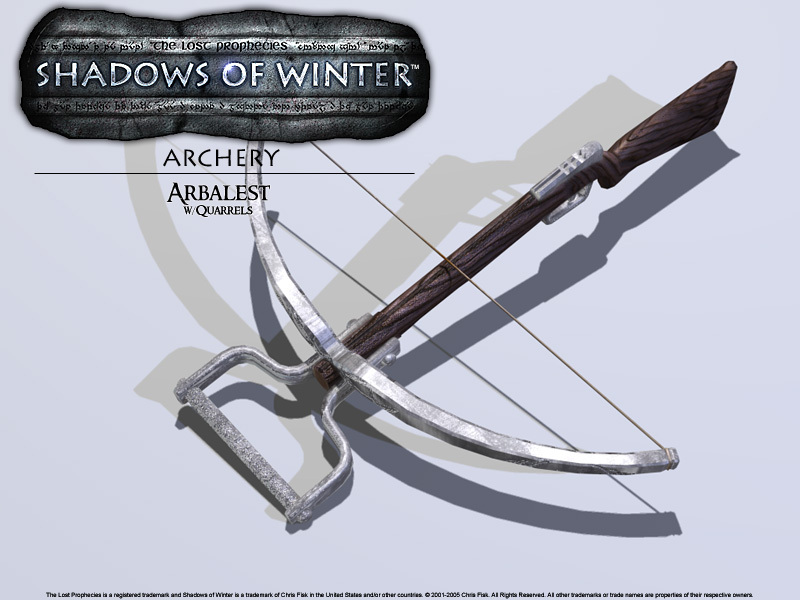 This heavy crossbow is the most devastating long-range weapon in all of Parmathia. Its ability to fire quarrels at high velocities allows it to puncture even the strongest of armour. PA will span the crossbow back and when released, the bow will fire. AA will load up to four additional quarrels (five in all) that can be fired simultaneously for a suppressive barrage into crowds. There is no aiming mechanism on this weapon and it possesses a powerful recoil that may offset the wielder's view momentarily when fired. This category contains the spells acquired through the teachings of the holy doctrine of Atrid: the All-Father. Within this scripture characters will uncover a vast amount of knowledge into the healing and protective powers of the divine. Each spell is denoted by a runic symbol that has been inscribed within the pages of this holy book and they may be discarded after inscription to make room for new spells if necessary. 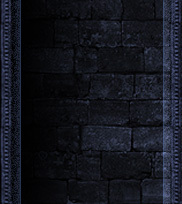 There are a total of eight spells within this category and the player may possess a maximum of three at any given time. By invoking the power of this rune the caster may restore lost Health and mend wounds on targets or themselves. Requiring a slight moment of concentration, PA will recover 25 Health after the incantation is completed. Allies who have been overcome and rendered unconscious (0 Health) can be revived with AA (available only in Multiplayer Modes). Their Health will be replenished to 5 and thus will require additional healing. VIS COST: 25 Heal/50 Revive DELAY: 10 EFFECT: Heals 25 Health/Revives Unconscious Ally (Multiplayer Only). Calling upon the power of this rune will purge the body of most manner of toxins and ill-effects. This spell will cure nearly any affliction after the incantation has completed. Potent toxins such as the dreaded "Tears of Sháh-Mát" or the corruption of the shadows cannot be cured by this rune. VIS COST: 20 Heal DELAY: 10 EFFECT: Cancels the effects of Burning DMG, Freezing DMG, Electrical DMG, Wyvern Venom Paralysis, Isa Paralysis, Blindness & Sombredein Possession (does not cure Possessed Lumorians). The results from an incantation with this rune will produce a magical barrier surrounding the target or caster. This barrier will withstand a collective 200 points of damage before it shatters. Used by the Sisterhood of Cathán during times of war, this rune is highly prized by those anticipating battle. VIS COST: 30 DELAY: 10 EFFECT: By placing the crosshairs on a valid target, the caster may bestow this spell upon an ally by pressing PA. AA will cast the spell on the casting character. Casting this augmentative spell upon a target or oneself will bless them with the increased speed of a divine warrior. For a short time the target will possess a faster movement rate that may temporarily cancel the penalties of wearing heavy armour. VIS COST: 40 DELAY: 10 EFFECT: By placing the crosshairs on a valid target, the caster may bestow this spell upon an ally by pressing PA. AA will cast the spell on the casting character. By invoking this rune, a caster may gain the ability to see in darkness for a short duration or bestow it upon an ally. The caster's eyes will glow a faint blue-violet throughout the spell's duration and may alert the denizens of the darkness of their presence. VIS COST: 35 DELAY: 10 EFFECT: By placing the crosshairs on a valid target, the caster may bestow this spell upon an ally by pressing PA. AA will cast the spell on the casting character. This rune will allow casters to bend rays of light that can render targets or themselves nearly invisible. The spell effects will last for 60 seconds. This rune was originally thought to have been created by the wizard-queen, Attyris. Legends say she had reigned over the lands several centuries before King Tyris I founded and settled the kingdom of Parmathia. She was said to have walked among her subjects without their knowledge to gain insight into the lives of the people she ruled. VIS COST: 50 DELAY: 10 EFFECT: By placing the crosshairs on a valid target, the caster may bestow this spell upon an ally by pressing PA. AA will cast the spell on the casting character. This rune will allow casters to invoke the spirits of the Iluxai and imbue the ground before them with their healing essence. By planting the holy rune upon the ground, the caster will summon a tiny geyser that springs forth healing waters. The geyser will last until its essence has been drained and will disappear when fully depleted. VIS COST: 100 DELAY: 10 EFFECT: PA summons a tiny geyser containing 150 points of restorative healing waters. When a player uses the geyeser, it will function like a healing station and disappear when fully depleted. The Order of the Dragon was believed to be the last covenant of magi practicing the black arts until they were wiped out by the Atridian Inquisition roughly two centuries ago. Founded by a high-priest of the Dragon God, Veraxis, from the eastern empire of Kahjin, The Order of the Dragon studied the destructive powers of their patron deity and harnessed a vast repertoire of powerful spells. When the Inquisition reached their libraries, many of their books were put to the torch. The books that had escaped the holocaust have been scattered throughout the world and the surviving magi have remained hidden in the shadows ever since. Each spell is denoted by a runic symbol that has been inscribed within the pages of this arcane book and they may be discarded after inscription to make room for new spells if necessary. 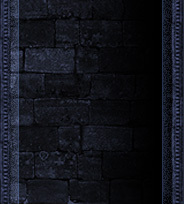 There are a total of six spells within this category and the player may possess a maximum of three at any given time. Channeling the virulent powers of dragons’ breath through one’s own hands, the invoker of this rune can cast a flaming sphere at high velocities toward a target from afar. Upon impact, the sphere will explode and cause damage to its surroundings. VIS COST: 30 DELAY: 15 EFFECT: Fires a ball of abysmal flames that causes 10 DMG upon direct impact and 2-4 DMG as splash damage. There is a likelihood that additional Burning BMG may be suffered by targets of this projectile. The mad wizard, Ruulakir, had sacrificed one of his eyes for the ability to foresee the future. Unfortunately, the spell had created an unexpected result that transformed his disembodied eye into a winged monstrosity that drove him deeper into the depths of insanity from which he would never return. Magi over the centuries have learned from his mistakes and have been able to produce winged spies to scry upon their enemies. This spell grants the caster the ability to see what the conjured eye perceives through a magical lens summoned at the same moment as the winged spy itself. Despite its menacing appearance, the Eye of Ruulakir is highly susceptible to physical injury and can be easily destroyed through both mundane and magical means. VIS COST: 20 DELAY: 5 EFFECT: Creates a winged eyeball that can be commanded to move wherever the caster designates as if it were a companion. The Battle-Sense radar will convert to display the creature's view and may leave the caster unable to sense enemies nearby. The eye possesses 25 Health and they will both vanish when either the eye or the caster have been slain. Casters invoking this rune will produce a crystalline projectile that fires at selected targets. The projectile will shatter upon impact and cause great damage to anything within a small radius. If a direct impact occurs, the target will become paralyzed for 30 seconds (or until the Sowilo spell is cast). This rune was perfected by a magus from the Covenant of the Dragon to be used against Eduin himself. Some believe the magus was actually Tylurymus (the God of Dragons) in a different guise. VIS COST: 40 DELAY: 5 EFFECT: PA projects a ice shard at enemies that will paralyze anyone directly struck by it for 30 seconds. Shrapnel will cause damage to those within its area of effect. When this rune is called upon, jagged bolts of electricity spring from the caster's fingertips and cause massive damage to targets and those unfortunate enough to be close by. During the Age of the Dragon many millennia ago the great wizard Tenesagus, seeking to create the ultimate means for making peace within the warring lands, unleashed the wrath of the heavens upon his own body and used it as a conduit to channel the forces of the storm through his hands and into the bodies of his enemies. The act nearly killed him and after decades of intense pain in the name of "keeping the peace" the wizard finally succumbed to the agony the spell forced him to endure. A few centuries after his death, the spell was perfected by The Covenant of the Dragon and has been used only by the most bold of magi. VIS COST: 50 DELAY: 10 EFFECT: PA charges electrical energy within the caster's hands and fires chain-lightning at a target. Allies nearby may be struck by the arcs leaping from the initial target and suffer the same damage. This attack has been known to leap through an entire group of enemies before fizzling out. This rune will allow the caster to manipulate objects through an understanding of relationships between all manner of things (both living and dead). When invoked, the power of this rune will grant the caster the momentary gift of telekinesis. Though not capable of dealing direct damage like the other spells of this grimoire, the Gebo rune is considered to be the most potentially destructive spell ever conceived within the Covenant of the Dragon. Adept casters have been known to catch arrows and other dangerous projectiles fired at them and return them back to their senders at high velocities. The darkness of eternity is a most overwhelming vision to behold with a mortal's eyes. This spell will cloak a target's vision in such emptiness, forcing them to lose their vision for 30 seconds or until the Sowilo spell has been cast upon them. Those afflicted with this spell appear to possess blackened eyes (similar to a rodent's) where no white is visible. VIS COST: 60 DELAY: 5 EFFECT: PA will blind targets within a certain range of the caster for 30 seconds or until a counter-spell is cast. With the fragile boundaries between the world of the dead and the world of the living severely weakened by the presence of a dark and powerful force, magi are able to magically enslave the abandoned corpses of the dead. These Revenants can be manipulated like a marionette by spellcasters and take a great deal of concentration to conjure. Due to the severely demanding levels of concentration required to maintain the Revenant, only one may be summoned at any given time. If an additional Revenant is summoned while one is already in service, the original will be destroyed and replaced by the newer Revenant. VIS COST: 60/100 DELAY: 10 EFFECT: PA randomly summons a Revenant Footman, Archer or Pikeman while AA summons a Revenant Knight to do the caster's bidding (functions as party member and can be ordered to perform simple tasks). rmour provides protection from all manner of damage inflicted upon the wearer. When the armour’s DEF rating has been reduced to “0” the armour will have been destroyed and the wearer will be forced to employ the services of a smith to repair it or find a new suit to equip. 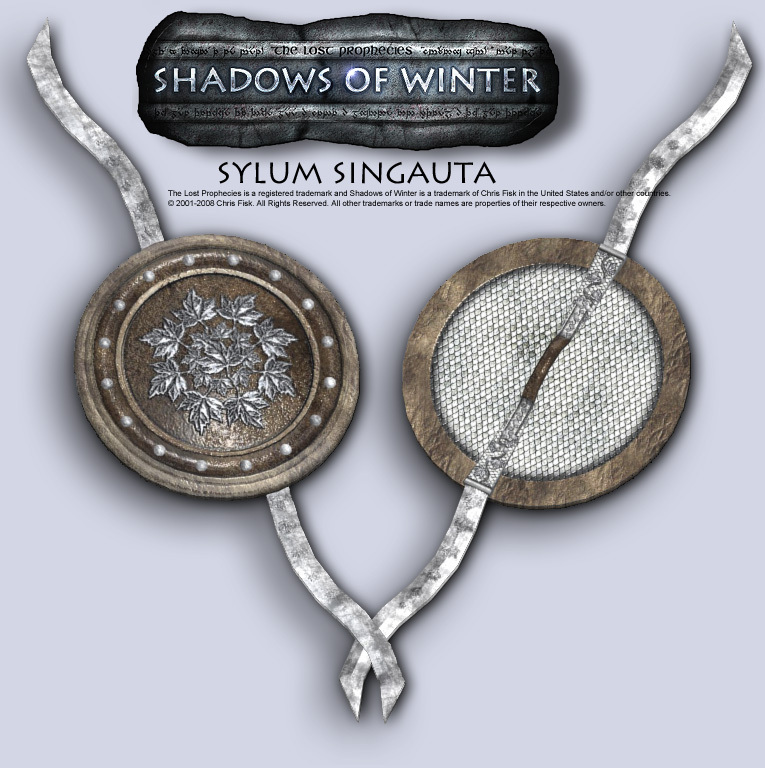 There is a variety of armour within Shadows of Winter and not all characters may wear every suit. Most suits also include a slight penalty to the wearer’s movement rate and may hinder certain characters who may be better off without the added padding. This armour consists of a byrnie of mail and sleeves/leggings to accompany it. 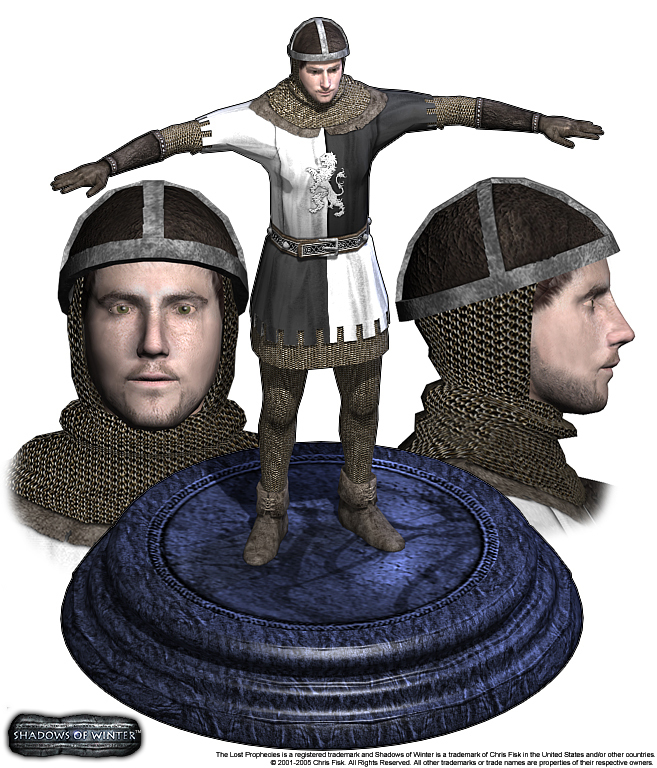 A helmet, gloves and a surcoat make up the remainder of the suit and, depending upon where the armour was acquired, the surcoat & helmet will reflect the allegiances of: Löwen (Black & White), Austerfeld (Blue & White), Onora (Red) or Brigand (stitched hide). Comprised of a long hauberk of mail that drapes to the knees, a pair of mail sleeves, mail leggings, leather gauntlets and completed with a helmet and surcoat, this armour offers more protection than Light Armour. 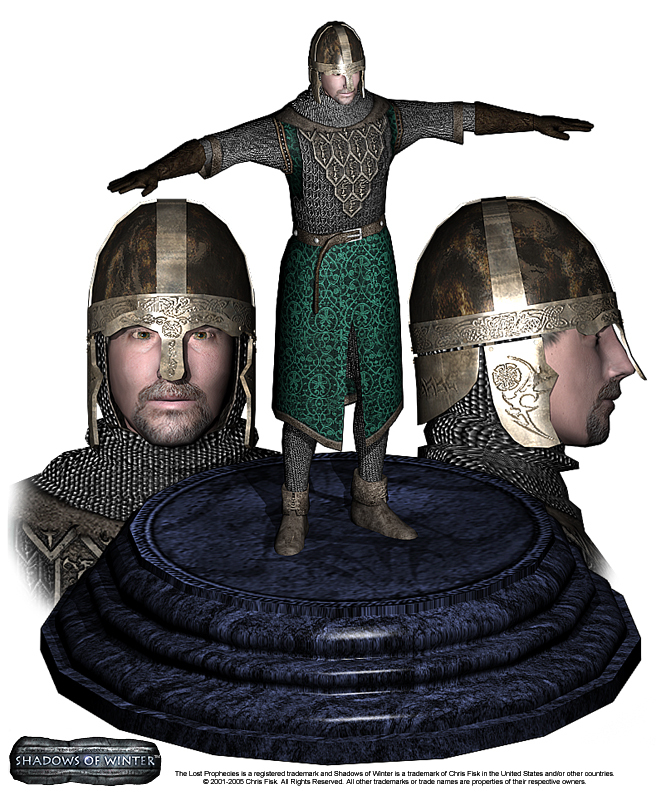 The surcoat and helmet will display different allegiances based upon where the armour was obtained. These allegiances consist of: Löwen (Black & White), Austerfeld (Blue & White) or Kardrak (Green). Employed by the guardians of the Temple of Cathán for protection, this armour can only be effectively worn by women. Offering an incredible range of mobility despite possessing a strong defense, the Cathán Armour is ideal for allowing the finesse of a Cathánite priestess to shine through its protective components. Comprised of a steel cuirass, greaves and a durable hooded-cloak, this armour's skimpy coverage is more than made up for with It's high level of protection. Crafted within the fiery depths of a Stowengarde forge, Lorica Segmentata displays the superior attention to detail found in dwarven craftsmanship. Constructed out of Hardsilver, metal plates are riveted & tied together to form a flexible cuirass with firmly secured pauldrons. A helmet, metal gauntlets, matching greaves & a tartan kilt complete this suit of armour. This full harness of plate armour covers most of the body and offers a great level of protection to its wearer at a small cost in movement rate penalties. A helm, cuirass, fauld, pauldrons, gorget, matching cuisse, greaves, vambraces, sabatons & gauntlets make up the bulk of this suit and different helms are acquired depending on where the armour was obtained: Sallet (Löwen ) or Horned Helm w/crest (Kardrak). Worn by Malithe-Spawn warriors, this dark and tarnished suit of mail offers a considerable amount of defense to its wearer. Comprised of a mail hauberk that drapes to the ankles, mail sleeves and leggings, tassets, a metal cuirass, vambraces and a menacing helmet, the suit works in a twisted harmony to make it easily recognized as a uniform of evil. Also referred to as "Sylum Armour" this suit is the standard uniform of the wardens of Sylum. A mail of Silverleaf scales covers the main portion of the body while a cloak, mantle, hood and happuri (face plate) offer additional protection for the upper areas. Bracers & Cuisse protect the limbs and do not restrict movement as much as armour offering similar protection. hields offer the wearer slight protection by being placed between the wearer and an opponent’s attack. When a shield is equipped, the Kick key becomes a shield bash. This does not increase the damage of the attack unless otherwise specified. Each shield offers a different area of coverage, movement rate penalty and durability. A shield’s area of coverage could spell the difference between a slight jostle and a massive head wound. The larger the coverage, the more area of the body the shield protects from harm. This may also slow the character’s movement rate down considerably. A shield’s durability describes how much physical abuse it can withstand before it is destroyed. When a shield’s durability rating is reduced to “0” it will fall to the ground and become useless. Only characters wielding Light Weaponry & One-Handed Weaponry may possess a shield. When a weapon from one of the other categories is selected, the shield will drop to the ground and may be picked up and used by someone else who meets the requisites for its use. Combined with a skilled master of the “Parry” technique, a combatant wielding a shield could be rendered nearly invulnerable to most mundane attacks. 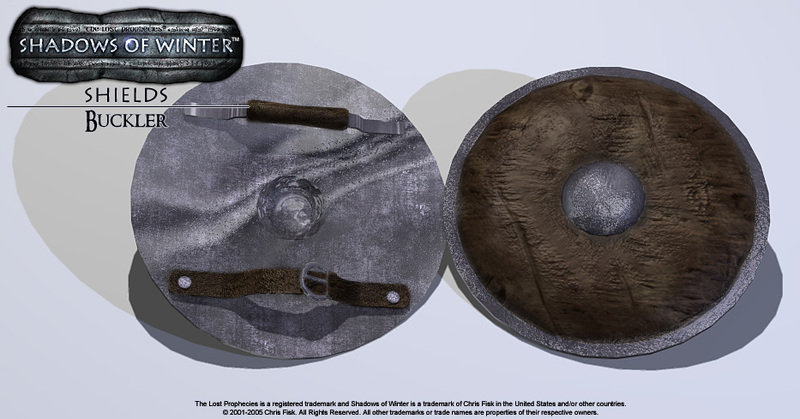 A small, light, round shield strapped to a combatant’s off-hand that provides very little coverage but may deflect a rare attack here or there, the Buckler is the weakest of all shields. This shield is most commonly seen on footmen wishing to balance speed with protection. A boss has been crafted into the center of it to allow the combatant to effectively maneuver the shield to block incoming attacks. DURABILITY: 35 MVT RATE: -10 COVERAGE: Medium RESTRICTIONS: Young Abigail & Camilla may not use this shield. Offering a larger area of coverage than the Buckler, the Knight Shield is the favored shield for mounted cavalry who wish to take full advantage of their increased vantage while gaining the protection of a shield. DURABILITY: 40 MVT RATE: -5 COVERAGE: Medium RESTRICTIONS: Young Abigail & Camilla may not use this shield. Similar to the Round Shield in all respects except one: the Targe possesses a sharp spike that protrudes from its central boss and can be used to gore opponents while shield bashing. This shield couples a good offense with a great defense. The largest of the shields and covers the most area for protecting the body, this heavy shield also considerably hinders movement rate and may prove more troublesome to combatants not versed in the intricacies of a "Parry" maneuver. 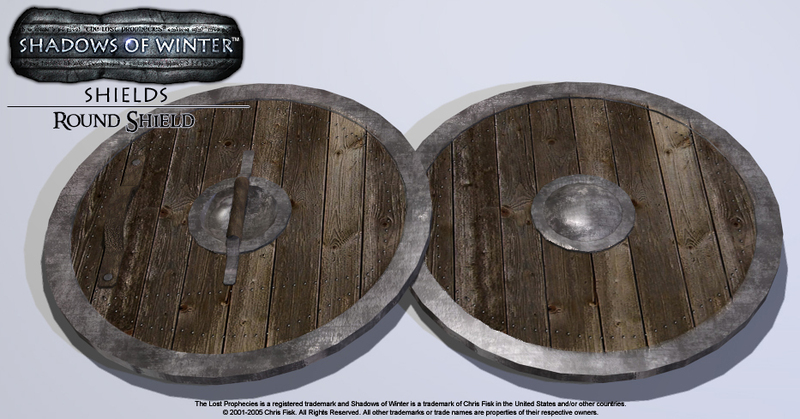 DURABILITY: 45 MVT RATE: -20 COVERAGE: Large RESTRICTIONS: Aurik & any female characters may not use this shield. Issued to the wardens of Sylum, this round shield is very light and possesses two blades that adorn the top and bottom of its exterior rim. Similar to the Targe, this shield grants the carrier a bonus in inflicting damage while shield bashing. A large Silverleaf motif is emblazoned upon the shield's defensive face and helps guide attacks away from vital areas effectively. hroughout the adventure, certain objects other than shields, armour and weaponry may be obtained by simply walking over them. These items offer their users additional options beyond attacking opponents. Food: Since most of the unfortunate peoples of Parmathia are starving, food has become another form of currency. If given to the right people, food can gain Callum favors, services or even information otherwise not available to him. If used, Food will slightly heal the weariness of the road (and 5-25 Health). Food examples include: Apple, Loaf of Bread, Carrot, Waterskin, Wineskin, Eggs, Potato, Roasted Chicken, Pint of Ale, Joint of Meat & Flagon of Mead. Small Vis Crystal: Adds +25 units of Vis for Grimoire spells. Large Vis Crystal: Adds +50 units of Vis for Grimoire spells. Vial of Tears of Sháh-Mát Poison: A very potent poison that mimics the effects of the Red Plague and can only be cured with the Sháh-Mát Antidote. The poison will inflict 5 DMG every 10 seconds upon anyone imbued with it until death (or the Sháh-Mát Antidote is administered). This poison can be coated upon any weapon simply by "using" it when a weapon is readied (with the only exceptions of grimoires). It will remain upon the weapon for thirty 30 seconds before it dissolves. It seems to have no effect on creatures twisted by the Sombredein. Tears of Sháh-Mát Antidote: This potion purges the body of any toxin including the deadly Tears of Sháh-Mát poison. Armourer's Hammer: This sturdy smith's tool will repair the player's shield to its full splendor. 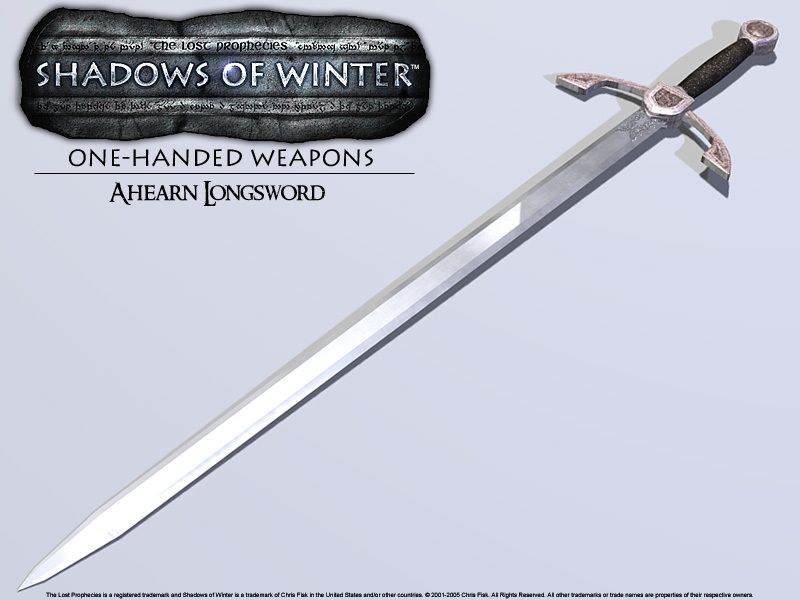 The dwarves of Stowengarde are renowned as the most skilled of all Parmathian smiths and one such craftsman may part with this tool for a small price. Wyvern's Venom Gland: Harvested from the corpse of a wyvern, this gland contains the same venom used to paralyze a wyvern's prey. When coated upon weapons (except grimoires) it will paralyze opponents for 1-30 seconds or until the Sowilo spell is cast or the Sháh-Mát Antidote is used. The venom will remain upon a weapon for 30 seconds before evaporating. Skade Petals: Plucked from the mysterious Skade Roses that only bloom in winter, these petals can be applied to any weapon (aside from grimoires) to inflict an additional +2 Freeze DMG every 3 seconds (up to 30 seconds total) or until the Sowilo spell is cast. The petals will remain upon weapons for 30 seconds before flaking off completely. Vial of Naphtha: This solution is highly volatile and extremely flammable. It can also be coated upon weapons (except for grimoires) to cause an additional +2 Burning DMG every 3 seconds (for a total of 30 seconds) or until the Sowilo spell is cast. The weapons will remain aflame for 60 seconds before being extinguished. 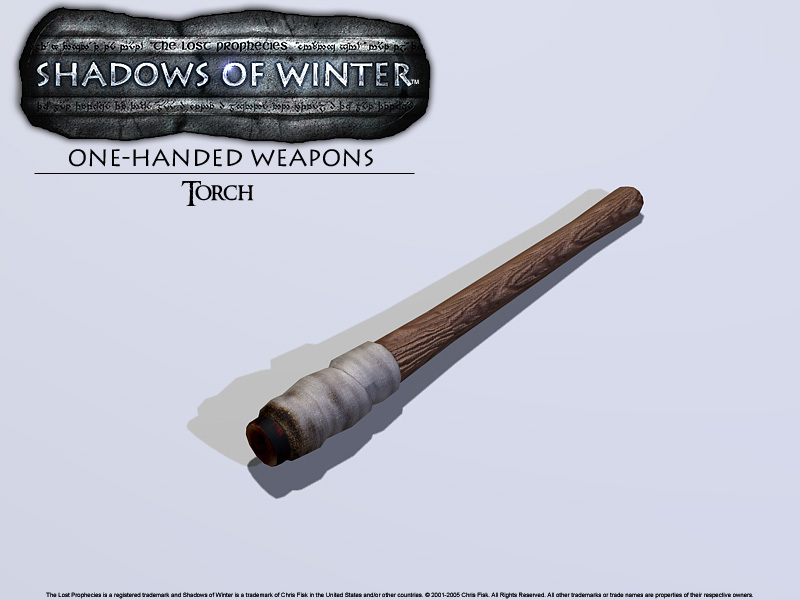 This item can be used to light one's way within the darkness and is required for the "Festival of the Fires" in the village of Fennon. o gain an advantage over pedestrian opponents, combatants may mount steeds that grant added movement rates and can deal damage to opponents on foot by simply charging into and trampling them. These steeds exist much like the vehicles within Half-Life 2 and need simply be “used” to be mounted and dismounted. The same applies for the boats available for piloting within Shadows of Winter. Bred for speed and stamina, these heavily-muscled steeds can carry a rider at tremendous speeds and may serve as a mount in combat. They do not possess protective barding and do not offer any additional protection to their rider but do add a tremendous bonus to a rider's movement rate and can ram/trample opponents. A rider must simply "use" the steed to mount/dismount it and may not leap from its back during high speeds. Weapons may be used while atop this steed with the exception of grimoires. Considerably larger and hardier than Thoroughbreds, Destriers are warhorses bred for battle. They wear protective barding and offer a slight defensive bonus to their riders but are slower than their lighter counterparts. A rider must simply "use" the steed to mount/dismount it and may not leap from its back during high speeds. Weapons may be used while atop this steed with the exception of grimoires. These creatures barely resemble horses at all. Completely covered in a heavy barding that is adorned with horns and spikes, opponents on foot will suffer immense damage when exposed to the animal's front and flanks. The barding offers the same protective bonuses as Destriers and these steeds allow riders to use all forms of weaponry including grimoires. This somewhat sturdy vessel is used to ferry visitors to and from the Isle of Cathán. Ornately decorated with a dragon motif and outfitted with a tiny lantern and oar, the Longboat may serve as a quick transport ship for Callum and his companions to cross large bodies of water. The boat must be "used" by the pilot while passengers simply need walk onto the empty space available near the bow of the vessel. If knocked off, the character overboard must swim alongside the vessel until a suitable area of land can be used to come aboard. Embarking/disembarking the Longboat can only be accomplished when it has slowed to a suitable speed or is completely stopped. When piloting a Longboat, weapons cannot be used and passengers must be relied on for defense.